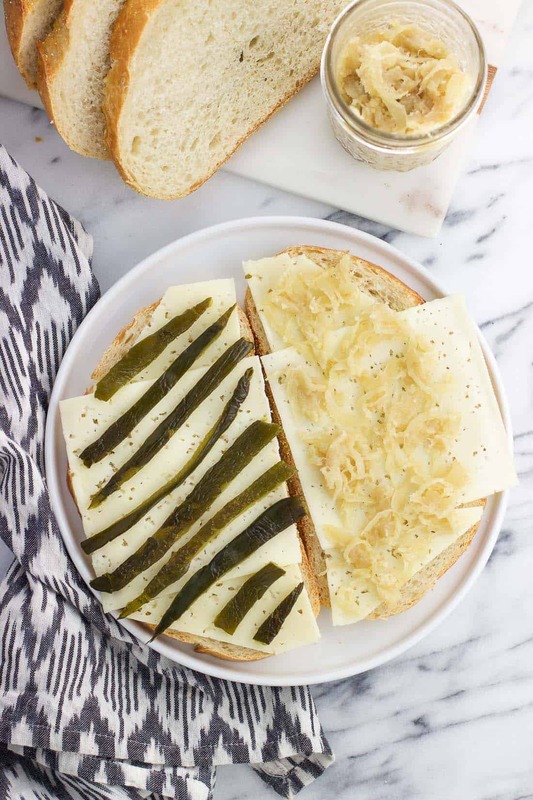 This sourdough havarti grilled cheese is filled with strips of roasted poblano peppers and caramelized onions for an ultra satisfying vegetarian grilled cheese sandwich. 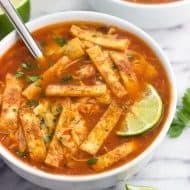 Easy comfort food perfect for lunch or dinner! This havarti grilled cheese sandwich was inevitable given my quest to use caramelized onions in ev-ery-thing lately. 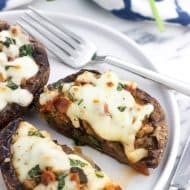 They’re probably one of the easiest “fancy” ingredients to work into a wide variety of savory meals. The mellower onion flavor and creamy texture are to die for…even if you’re just eating them solo on a spoon. Since a batch of caramelized onions coincided with a leftover roasted poblano pepper in my fridge, making a grilled cheese with them both was a no-brainer. 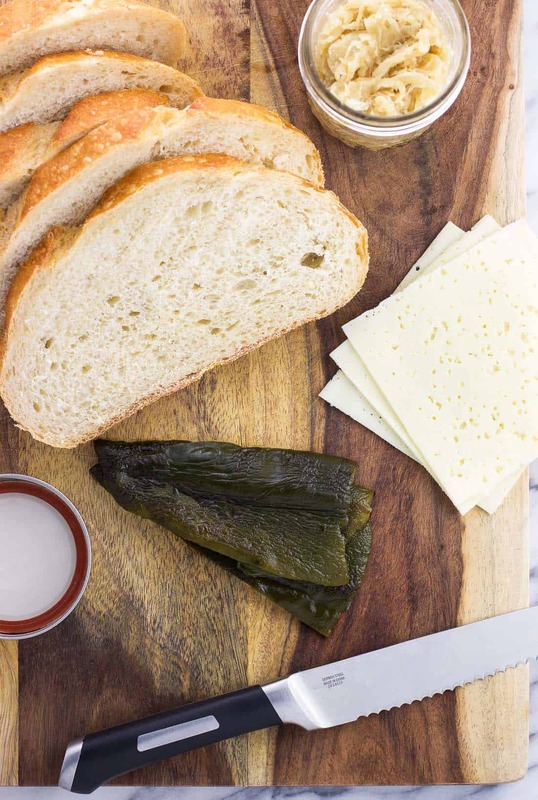 If you already have long-standing grilled cheese preferences, go right ahead and add these two ingredients into your fave grilled cheese and enjoy. 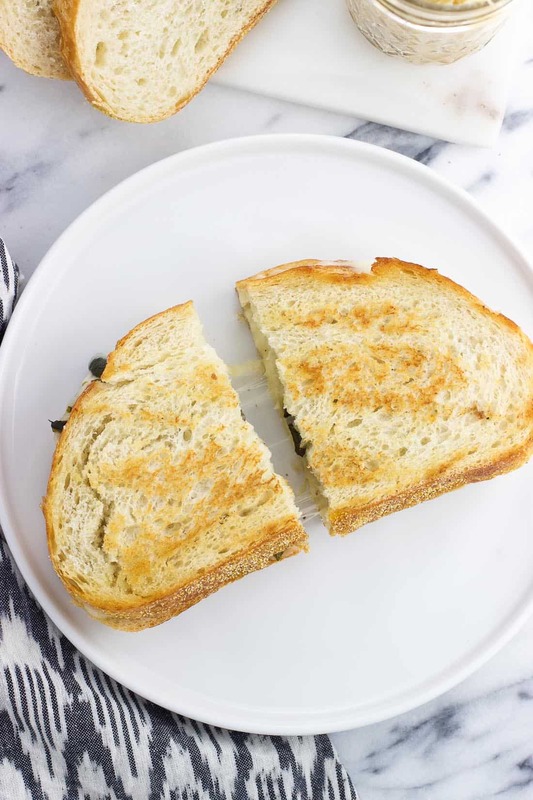 But if you’re open to a simple but specific grilled cheese combination, keep on reading! What bread are we using here? While I’d probably eat cheese melted between two slabs of wood, sourdough bread is something special to use in grilled cheese sandwiches. It’s well structured without many holes, so it holds up to flipping and doesn’t allow all that melty cheese goodness to leak out. Plus the tanginess adds a great flavor! My kitchen fantasy is to have my own sourdough starter and bake loaves from there, but since I have a hard enough time keeping low-maintenance plants alive, I haven’t worked up the courage to maintain something alive in my kitchen. 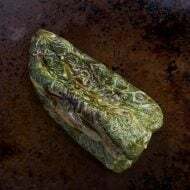 If you’re buying a loaf of sourdough from the grocery store bakery section like I do, look for a wide loaf so you’ll have a fair amount of surface area for cheese and toppings. Leftover chunks would be faaaabulous in a sausage strata with asiago and asparagus. 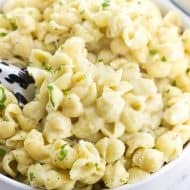 Just about any kind of cheese that can melt would work here, so go to town and make this your own! I find havarti is a mild flavored cheese that melts beautifully and gets very creamy in a hot sandwich. 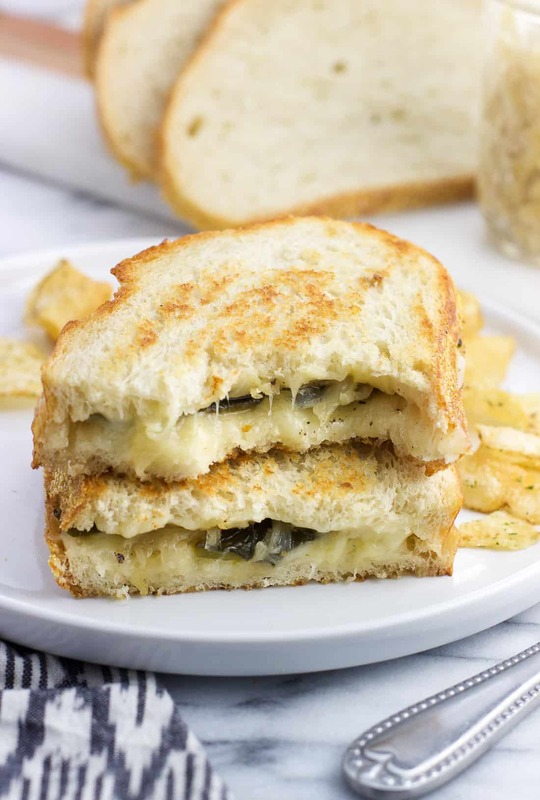 It doesn’t get in the way of stronger flavors like the roasted poblanos, and is the perfect complement to the roasty-tangy-jammy-ness in this havarti grilled cheese. 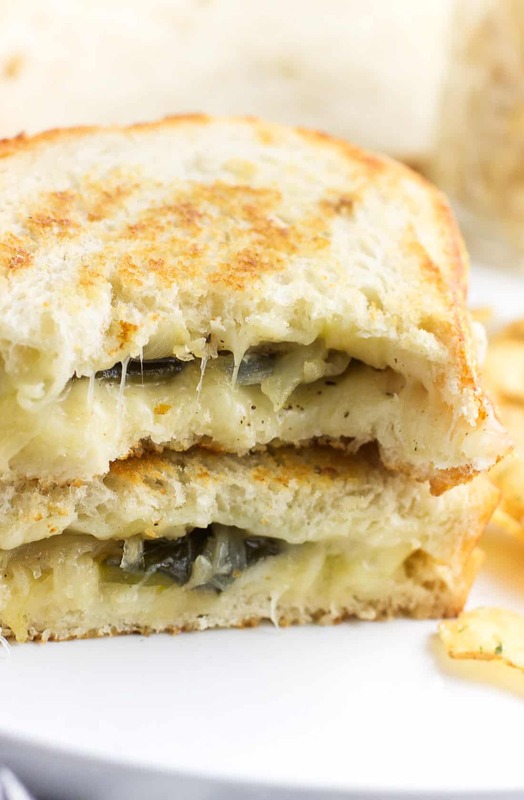 If you’re looking for a spicier option, try pepper jack. It makes this buffalo chicken grilled cheese. 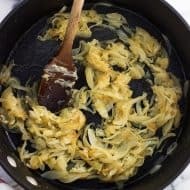 Both the roasted poblano peppers and the caramelized onions can be made several days ahead of time and stored in the fridge. 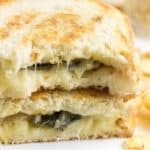 Next time I make this havarti grilled cheese I plan to split it and serve each half with a bowl of Italian sausage soup. Kind of like a homemade Panera You Pick Two, for two. Evenly arrange cheese over both slices of bread. Top with sliced poblano and caramelized onions, then cover with the other side of bread. Place a skillet over medium heat and allow to heat. Add 1 teaspoon of the butter and swirl it around the pan as it melts. Place sandwich in the skillet and cook for a few minutes until the bottom side is golden-brown to your liking. Remove sandwich from the skillet and add the remaining 1 teaspoon of butter. Swirl so it melts. Add the sandwich, cooked side up, back to the skillet and cook until the other side is golden-brown. Slice in half and enjoy. Nutritional info is estimated for one whole sandwich (both halves). In the mood for more? 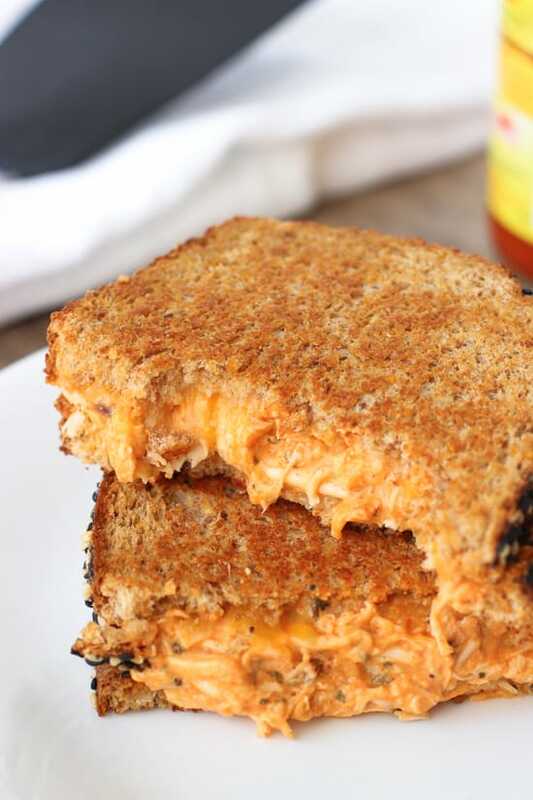 Next time try this buffalo chicken grilled cheese. 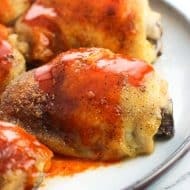 A rotisserie chicken makes assembling the buffalo chicken a breeze.